Original Set (left) and 6x model (right). Photos from Gizmodo. After completing my project, I found that there is actually a page in the Unnoficial Lego Builder’s guide showing examples of a brick at 4x, 6x, 10x and 12x. 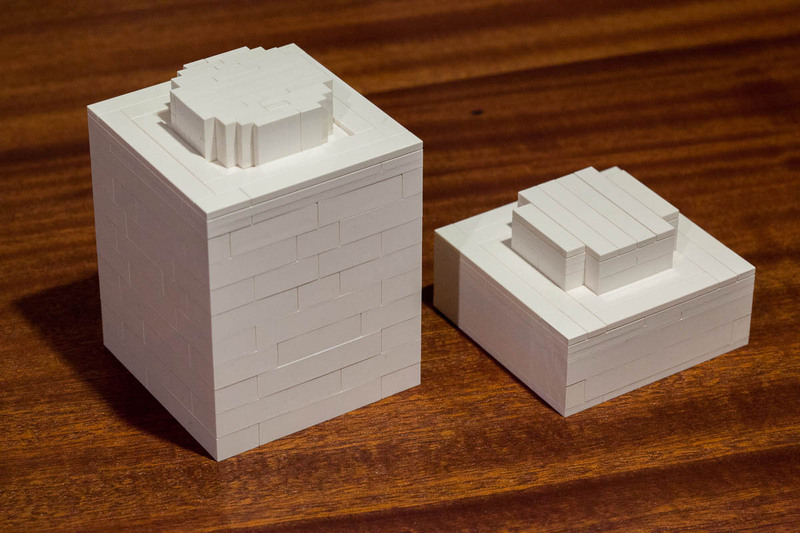 There aren’t nearly enough bricks in the Architecture Studio set to build a large-scale model of anything beside building a couple simple bricks. 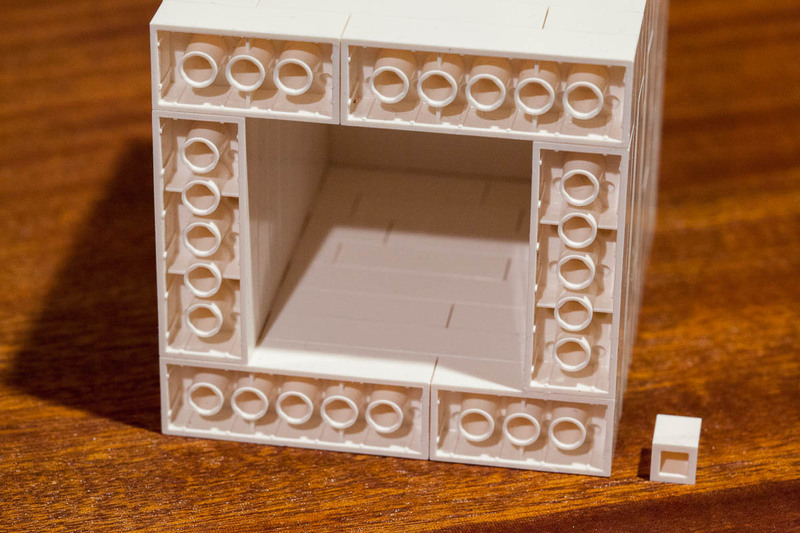 Based on the underlying proportions of the common Lego brick which I determined in challenge #18, I determined that it would only be possible to build a true scale Lego brick with walls and studs of the right proportions if we use a scale which is a multiple of 5. I chose 10x scale, as it was the easiest method I could think of to get the stud height to scale too. I planned to build the walls of the oversized brick normally and build the top stud sideways. 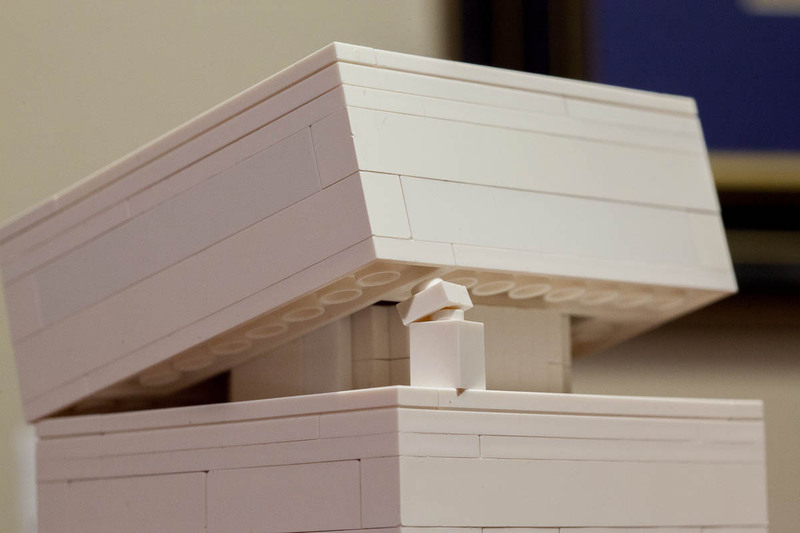 This resulted in an accurately proportioned brick, but the stud isn’t pretty and it’s an important part of the Lego brand. 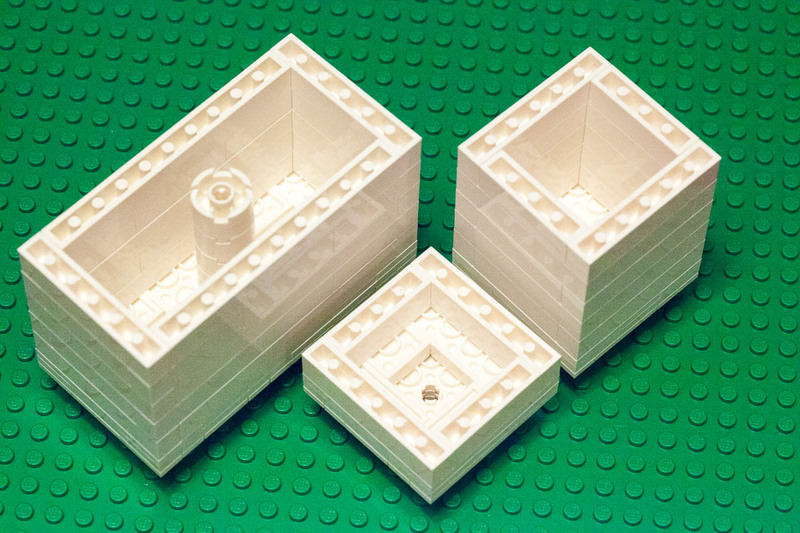 Upon completion of these massive bricks, I understood why people gravitate to 6x scale even if it isn’t perfectly proportioned – you can use pre-existing 4-stud diameter bricks as the stud! I decided to also try the 6x scale, and I agree that this is a nicer scale to work with. The stud on top looks better since it is actually round. 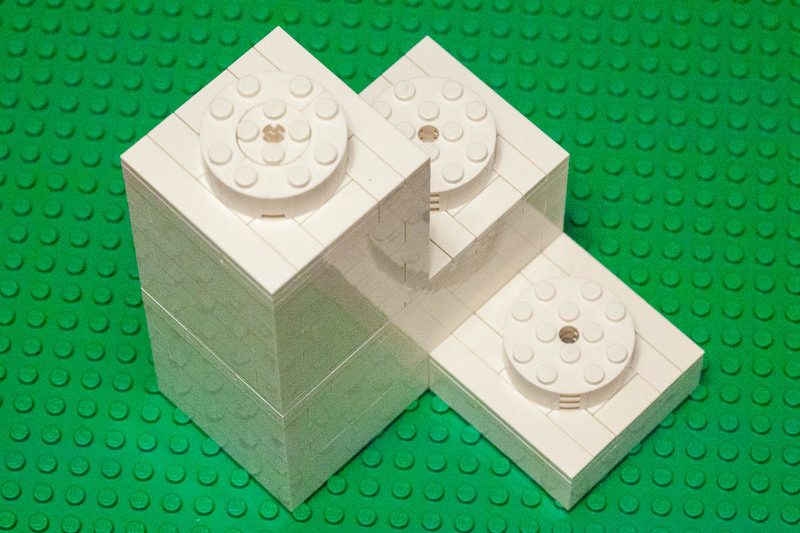 This also allows normal rotation of a brick attached to just one stud. It also uses many fewer bricks to build each brick. I captured a couple photos from this approach as well. 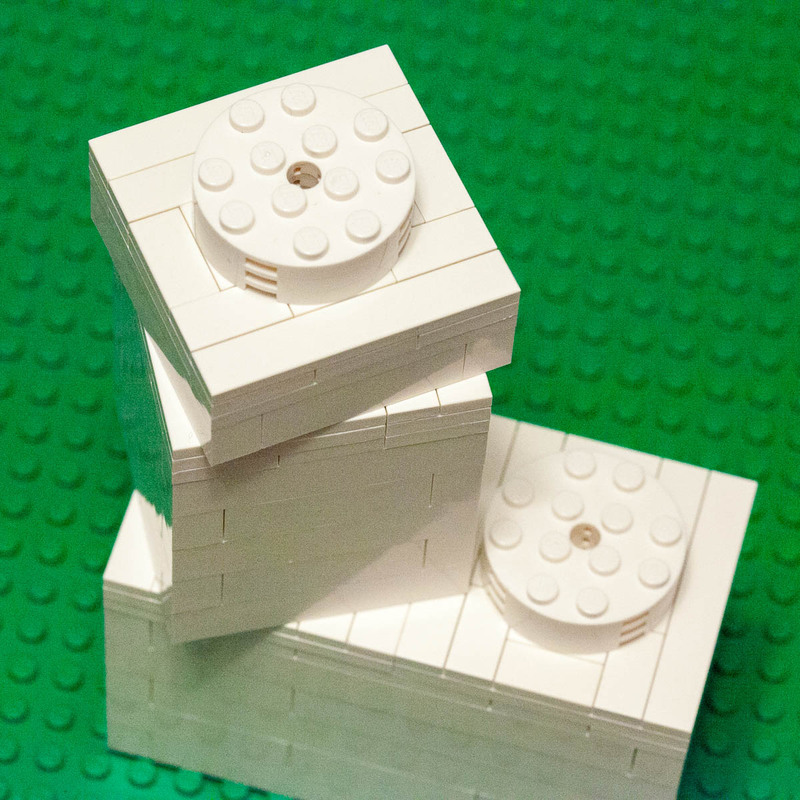 6x scale bricks and plates are more manageable to build. Underside of 10x scale brick. project time: 1.5 hours, since I built them at two different scales.